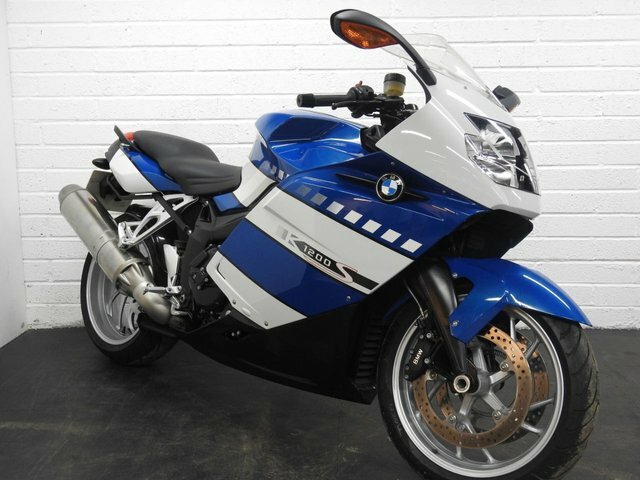 Immaculate well cared for K1200 S with only 5700 miles from new. Anyone would be hard pushed to find a better example than this! First to see will buy! FULL BMW SERVICE HISTORY - serviced every year with BMW regardless of the mileage. High spec - ABS Brakes, ESA suspension, Heated Grips, Main Centre Stand, On board computer, BMW alarm, Pannier rails and fastenings. Immaculate bike. sold with 1 year MOT. If you are looking for a shining example of this popular BMW K1200 S then look no further! this bike would make an ideal addition to anyone's collection! please phone if you have any questions or if you would like to arrange a viewing. Finance specialists - please talk to us if you would like to spread the cost of your purchase. - Nation wide delivery available, too far for you to come and view? ask us for a video of this bike! All PX's considered. All of our bikes are HPI checked and clear (unless clearly stated). For further information please phone 01344 887007 or 07506 105058 FINANCE SPECIALISTS / PART EXCHANGE WELCOME / WARRANTY AVAILABLE / CREDIT AND DEBIT CARDS ACCEPTED / DELIVERY POSSIBLE. To arrange a viewing or to discuss your options further, please feel free to contact us on 01344 887 007 or 07506 105 058 Rideworx specialise in motorcycle sales and finance. We also offer full workshop and diagnostic facilities for all your service needs.